The Seventeenth Judicial District Commission on Judicial Performance unanimously recommends that Judge Michael A. Cox BE RETAINED. 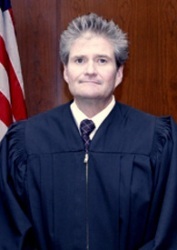 Judge Michael Cox received both his undergraduate degree and Juris Doctor from the University Denver. Prior to his appointment to the Adams County Court, Judge Cox served as an attorney in private practice. During the current term Judge Cox’s case load consisted of 50% Criminal, 25% Misdemeanor and 25% Traffic. For more than 20 years, Judge Cox has been involved with Adams County 4-H programs. He works as a volunteer at DIA assisting passengers and the public as they travel through Colorado. He is also deeply involved in the “Every 15 Minutes” program which enlightens students to the dangers and consequences of drinking and driving. Judge Cox also gives his time as an active participant and past Board Member of Almost Home, Inc., and is a volunteer photographer for events at The Armory Performing Arts Center in Brighton. The evaluation used by the Commission included a review of Judge Cox’s survey results, courtroom observations by Commissioners, review of legal opinions authored by Judge Cox, his self-evaluation and a personal interview with the Commission. Surveys distributed to both attorneys and non-attorneys associated with cases assigned to Judge Cox provided broad statistics in assessing his effectiveness. Judge Cox received a strong approval rating by those he has interacted with in his courtroom during this term. Of attorneys responding to the survey, 93% recommended to retain, 6% not to retain, and 3% made no recommendation regarding retention. Of non-attorneys responding to the survey, 92% recommended to retain, 4% not retain, and 4% made no recommendation regarding retention. (These percentages may not total 100% due to rounding). Judge Cox indicated that ensuring the dignity and respect of all people is of prevailing importance to him, and carries that principle into the courtroom. Judge Cox has been found by the Commission to be a highly qualified, competent and a respected member of the Adams County judiciary. Though criticized in the past and during the current evaluation period for his fast-paced speaking style, the Commission believes Judge Cox has made strides to correct this issue to ensure that all parties in the courtroom feel confident in their understanding of rulings and sentencing. Judge Cox is commended for his demeanor in court, his knowledge of the law, the ability to control his docket and to keep the process moving at an appropriate and fair pace. Based on its review, the Commission unanimously recommends that Judge Michael A. Cox BE RETAINED.